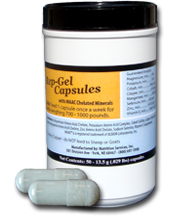 MAAC® Rep Gel Capsules are an easy to feed Bolus, with no mess and no wasted product (can’t spit it back out). It contains chelated Magnesium, Potassium, Copper, Manganese and Zinc in the same ratio as the MAAC® Replamin Gel. These chelated minerals help to improve muscle functions and can prevent joints from popping from increased freedom of motion. Additionally, these minerals have been proven to stimulate reproductive hormones and increase overall milk production in cattle.